Each year, different events take place centering on the themes of the Common Reading Experience (CRE). 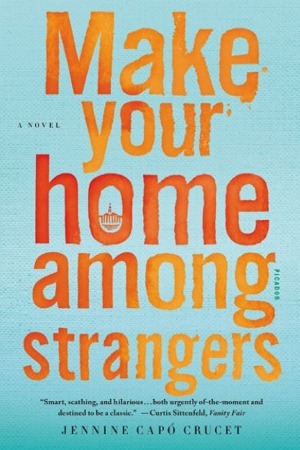 This year’s CRE is “Make Your Home Among Strangers” by Jennine Capó Crucet. This powerful novel’s themes include social justice, quality/access to education, first-generation students, immigration, ethics (plagiarism), diversity, inclusion, identity, relationships, socioeconomic class, race and leaving home. All campus and community members are welcome and encouraged to come and participate in any event you might find interesting! Travel Challenge Escape Room – Tuesday, Sept. 26, 5:30-7 p.m., Holmes Student Center, Capital Room. Solve riddles and puzzles while you learn about the American immigration experience. Make Your Home Open Mic – Wednesday, Oct. 11, 3:30 p.m., Swen Parson room 170. Share your story of what home means to you. Eight Countries in One Day – Friday, Oct. 13, 3-7 p.m., DeKalb Public Library. Explore culture, food and crafts from countries around the world. Making a Home Among Strangers, an Evening with Jennine Capó Crucet – Tuesday, Oct. 17, 6:30 p.m., Holmes Student Center, Carl Sandburg Auditorium. Book Discussion; The Travel Ban: Immigration – Thursday, Oct. 26, 6:30 p.m., DeKalb Public Library. Essay Contest – open to all First- Year students. Entries due Monday, Oct. 30, by 4 p.m. Submit your essay and cover sheet to Maribel Montelongo, First-Year Composition Office support specialist, Reavis 215. Ju Hong – Tuesday, Nov. 14, 5 p.m., Holmes Student Center, Carl Sandburg Auditorium. Ju Hong shares his story as one of the millions of undocumented immigrants living in America today. His documentary, “Halmoni,” follows his struggle to understand his identity and familial responsibility. Make Your Home Essay Contest Awards Ceremony – Wednesday, Nov. 15, 3:30 p.m., Adams Hall, Chandelier Room.